The usual bravado and confidence of the SNP was decidedly lacking on Thursday night as it quickly became apparent that things weren’t quite going to go their way. Initial indications that the SNP was on the ropes came when Alex Salmond’s election agent - former Peterhead councillor Stuart Pratt - said he was “less than confident” at the result, several hours before the announcement arrived. This was in stark contrast to West Aberdeenshire & Kincardine Tory Andrew Bowie who said he was having “quite a good night”. “We have fought a great campaign - absolutely fantastic - we have travelled the length and breadth of the constituency and I’m absolutely shattered. “The reception I’ve been getting from everyone has been just great,” he said. As the night wore on, an air of excitement spread around the hall, with whispers that it could be a good night for the Tories - a great night in fact, with perhaps the possibility of a real upset. 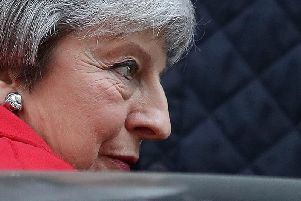 As results from elsewhere started to roll in, it became clear that there was something big happening and that Theresa May’s call to hold a snap General Election in the hope of strengthening her hand had somewhat backfired. The SNP contingent at the AECC meanwhile, were looking glum as they checked their phones and tallied up their predictions. West Aberdeenshire & Kincardine was the first of the Shire votes to be announced, with sitting MP Stuart Donaldson a major target for the Tories. Unfortunately for Mr Donaldson, that was not the case, with the Tories taking their first scalp of the night with a victorious Andrew Bowie taking the seat with a 7,950 majority. In his victory speech, Mr Bowie MP said: “Two years ago I stood in this very hall and listened to the then First Minister declare that the lion of Scotland had roared. Well, today I think it’s the people who have spoken. “I’m hugely honoured and incredibly humbled to be elected by the people of West Aberdeenshire & Kincardine to serve them in the House of Commons. “I do not know if there has been across the whole country a more well-mannered campaign than the one we have just fought in West Aberdeenshire & Kincardine and I have to thank my fellow candidates John, Barry and Stuart. He then thanked a number of people including his election agent, campaign manager, teams in every single ward and his wife for her “support, encouragement and patience.” throughout the campaign. “I promise I will represent everyone in West Aberdeenshire & Kincardine irrespective of how you voted, or even if you did not vote at all. “The future prosperity of this constituency is the top priority for me supporting our oil and gas sector, the farming and agricultural sector in this time of transition and championing our world-leading tourism and hospitality sectors. “I and my Scottish Conservative colleagues will be unceasing in our resolve to fight, champion and represent Scotland, but we will be doing so proud of our United Kingdom, proud of our shared past and optimistic about our shared future. Taking to the stage, Stuart Donaldson thanked his family and staff, election agent and all who had been out and campaigned for him. “It’s been an absolute privilege to serve as the MP for West Aberdeenshire and Kincardine . It’s an area that’s given me so much and I’m sorry I didn’t have more time to give more back,” he said. He thanked all the other candidates and wished Andrew well in representing “our wonderful part of the world”. All attention then focused on Gordon, where former First Minister Alex Salmond was defending an 8,000-plus majority from 2015. The vote was announced with a media frenzy as word spread that the former MP for Banff and Buchan could be out. And just moments later the rumour was confirmed with Tory Colin Clark, who had been confident and calm throughout the process, taking the biggest scalp of the night with a 2,607 majority to boot. All eyes then turned to Banff & Buchan, where the SNP’s Eilidh Whiteford had romped to victory in 2015 with a whopping 14,000 majority. Could it be a triple whammy for the Tories? And her gloomy prediction proved correct as the Tories triumphed again, with David Duguid taking the seat with a 3,693 majority, ending the SNP’s 30-year reign in Banff and Buchan.